There is much discussion about whether the Occupy Wall Street movement should issue "demands." After spending a fair amount of time at Occupy Wall Street and some of the other Occupations on both coasts, my feeling is that the platform (a more accurate word) behind the movement has plenty of time to develop. OWS has simply turned the light on at the scene of the crime, that being Wall Street, and now we have the opportunity to do the serious work of gathering evidence, making the case, and developing arguments for a more just and democratic economy. Bob Bows, a member of PBI's board, likens it to a national "Teach-In." This movement is not going anywhere anytime soon - we have plenty of time to discuss the issues surrounding the many economic injustices. Many of us from the Public Banking Institute have stood on the corner of Broadway and Liberty in NYC, holding conversations with complete strangers about monetary reform, whether making money off money is "productive," the future role of the Fed, etc. etc. etc. If you have a chance to visit Occupy Wall Street be sure to go - and bring a sign! After having spoken at a number of working groups in Oakland, D.C., NYC, and Philly, I would like to share the case that I make for creating 50 state-owned banks. States have natural, state-based economies that require a money supply. Having private banks be in charge of this money supply is akin to letting them hold each state's economy hostage - they can refuse to make reasonably priced loans and end up creating a liquidity crisis. At its core, there is a sovereignty issue here - whether transnational private banks should control our money supply or whether the elected representatives of the people should. Think of a public bank as your local library – you are able to “borrow” public credit in the form of money, which you then return according to the specified term. Or, consider a public bank as open space – the public resource enhances the value of the entire city. You can also image a public bank as an open marketplace – the standards set are democratic and transparent and lead to fair and just economic transactions. State owned banks can enhance the economy and create more diversity in lending products. Why is affordable credit important? Just ask any small business person who can only receive a small business loan in the form of a personally guaranteed credit card at 16% per annum interest. Just ask any student who has no job and is tens of thousands of dollars in debt at 8.5% interest. Just ask any manufacturer who wants to expand capacity and cannot find a lender. These people comprise all of our communities – without access to affordable credit they are at the mercy of private bankers. 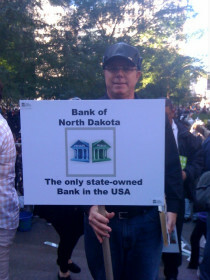 There is no alternative in the market, which is exactly why each state should start its own bank. Our city and state tax payments are now used to fund – for private gain – overseas businesses that compete with the same businesses and individuals that made these tax payments. Our city, county, and state Treasurers are critical links in this picture because they deposit the public’s money into private banks. What the public receives, theoretically, is safety, liquidity and a small rate of return. Today no reasonable person would attempt to make the case that these banks provide safety, and yet state, county, and municipal treasurers continue to place hundreds of billions of public money into the hands of transnational private banks. For a paltry return of one or two percent, public funds are leveraged and used to create returns of many times that for the private banks. Public officials have been central to this giveaway – they have been cowed by the now obsolete notion that government, the very government they represent, is the enemy. But in our economy today, and for too long, banks create and control money, not the government. Over 90% of the money supply in the USA is created by banks issuing loans. With every loan, the money supply increases and with every loan repayment, the money supply shrinks. The one exception to this private control of the money supply is the sovereign state of North Dakota, which does business as the Bank of North Dakota. It creates money in the form of low interest loans for its people, resulting in the lowest unemployment rate, lowest foreclosure rate, biggest budget surplus, fewest bank failures (zero in over 12 years), and greatest number of community banks per capita in the U.S.
For the rest of us, our money supply is at the mercy of private banking’s characters who have no interest in serving the public. It's time for bankers to get out of the business of governing by each state creating its own bank.